Hold a surprise inspection with your Housekeeping team. Lay aside 10 one-dollar bills for each Team Member. For every item not up to standards, deduct $1. If they finish the inspection with all 10 bills, give them another 10! Find the hidden Housekeeping bucks—and they’re yours! During Housekeeping Week, hide play money (or create your own custom “Hotel Dollar”) in rooms before they’re cleaned. Pick areas that may be overlooked. At the end of the week, Housekeepers can trade the play money in for prizes. For added fun, hold an auction and have Housekeepers use their play money. Prepare a room so that it has a variety of items that are not up to standards. Examples: burnt-out bulb, no batteries in the remote, not enough coffee packs, etc. Give each Housekeeper a set time to see how many issues they can spot. Or divide into teams. Have a prize for whoever finds the most issues, or whoever finds everything the fastest. A fun way to test—and improve—your team’s knowledge! Prepare 15 or 20 trivia questions. Questions can cover everything from Housekeeping standards to hotel trivia. See who gets the most answers right. For added fun, invite other departments to participate! 5. The Price is Right. Have fun while teaching how much things cost! Gather a variety of Housekeeping amenities (soap, toilet paper, coffee packs, towels, etc.). Ask contestants to write down the monthly or annual cost to the hotel for each item, along with a grand total. Then one by one reveal the prices, adding things up as you go. Whoever is closest to the grand total wins! For added fun, invite other departments to play along! Draw a card for each perfect room inspection! Get a deck of playing cards. During the week, inspect a total of five rooms for each Housekeeper. Each room that passes inspection “earns” a card. At the end of the week, whoever has the best poker hand wins a prize! Variation: Inspect one room per Housekeeper, and offer three to five cards, based on the results. Who knows the brand standards the best? Embassy Suites by Hilton Cincinnati – Northeast (Blue Ash) hosted a “Family Feud” game, using brand standard items as questions. The team who rang the bell first got to answer the question and win a point. At the end of the contest, the team with the most points won! Celebrating Housekeeping Week in 15 Minutes or Less! Hilton Prague recently recognized their laundry team with a variety of creative events, all of which took 15 minutes or less. Examples included an ironing competition (the team who has most pieces ironed wins), and a competition to find and repair missing shirt buttons and darn socks with holes. The week’s worth of competitions took less than one hour. Who makes the fastest bed at your hotel? See who can strip and make two beds to standard in the shortest amount of time. Or, if you have the space, put three or four beds in a meeting room, gather the entire team, and see who can strip and make them the fastest. Grab a stopwatch and have a prize for the Fastest Bed Maker. Hampton Inn by Hilton Lexington – Historic District had a word jumble contest using words related to housekeeping. Each Team Member had 15 minutes to complete the contest, and the winner received a prize! Print pictures of dust bunnies on slips of paper, and hide them in rooms in hard-to-clean areas. Offer a small prize for each dust bunny they find! Whoever finds the most Dust Bunnies (and cleans their area) during the week wins a grand prize. Hilton London Metropole had a quiz for the Housekeeping supervisors during morning huddle, and a prize was given to the winner. For the room attendants, a number was hidden on every trolley, which they had to find and bring to the housekeeping office to find out what prize they had won. Hilton Houston NASA Clear Lake bought a brand new housekeeper’s cart, vacuum, and other equipment and painted them gold. The Executive Housekeeper kept a log of all the 9’s and 10’s that were received on the Guest Service Scores for Cleanliness of Room and Bathroom. Whoever got the most, got to use the equipment for the following month. A little thanks and a chance to win big! It’s like a Catch Me® card with a twist. This week, if you catch someone doing something outstanding, write a thank you card, and insert a Lotto ticket inside. Variation: If your state doesn’t have a lottery, create your own lottery. Write down a number on the thank you card, and reveal the winning numbers at a team huddle. They keep the hotel sparkling. Let’s keep their cars sparkling. Since Housekeepers clean up after others, Hampton Inn by Hilton Indianapolis – Ne/Castleton decided to clean for them: The hotel organized a car wash. Housekeepers relaxed with refreshments, while managers washed their cars. The perfect thank you after a long day on their feet! Housekeepers spend lots of time on their feet. During International Housekeeping Week, Hampton Inn by Hilton Tooele treated the Housekeeping team to a pedicure, the type that includes a foot and lower leg massage. Variation: Take the team to lunch and a pedicure. Get those vacuums in tip-top shape! The Engineering team at DoubleTree by Hilton Hotel Tucson at Reid Park showed how much they appreciated their Housekeepers by giving all the vacuums and carts a good cleaning and tune-up, so they worked as good as new. They also wrote personal thank-you notes to the team. Hampton Inn & Suites by Hilton Pigeon Forge On The Parkway planned a Spa Sampler and treated Housekeepers to onsite treatments such as heated neck wraps, cooling eye treatments, hand and foot treatments, exfoliating treatments, and tips on relaxation techniques. 20. A World of Thanks. Say thanks with luncheons from around the world! Give Housekeeping “A World of Thanks” by planning five days of meals with an international theme. For example: Mexico (build your own tacos), Italy (pizza or spaghetti), USA (burgers & hotdogs), France (croissant breakfast sandwich), and so on. Use custom materials to create high-impact recognition, without the cost. The materials located at www.Hilton-Recognition.com/Housekeeping include a variety of high-impact tools that are easy to use and cost nothing. You’ll find certificates, thank you cards, and much more. All content is customizable, including language. Hilton Minneapolis uses Housekeeping Week as a time to recognize Team Members who had perfect attendance for the year—and surprises them with a prize, or a free day off! You can also extend this recognition to other achievements, like service anniversaries, cleanliness scores, and more. 23. The Amazing Room Count! Homewood Suites by Hilton St. Louis Riverport – Airport West takes pictures of each Team Member, then tallies the number of rooms they clean per year. Take the average number of rooms cleaned per day and multiply by guesstimated number of days worked. Write this figure down, and post it next to their picture in a team area, along with a note of appreciation for their efforts! Invite all departments to bring a dish for a big potluck lunch honoring your Housekeeping team. Let your Housekeepers judge the dishes and have prizes ready for the winners. If you’re a larger hotel, invite a different department to sponsor lunch each day of the week. Invite the whole family for a team get-together! Homewood Suites by Hilton Fargo holds a Sunday afternoon cookout for the Housekeeping team and invites families to attend. Games are held, prizes are given, and everyone enjoys meeting each other’s families! Invite other departments and ask them to bring food and refreshments. Create a lasting memento. Open a Shutterfly or Tiny Prints account online. This will enable you to order custom thank you cards, complete with a group photo of your team. 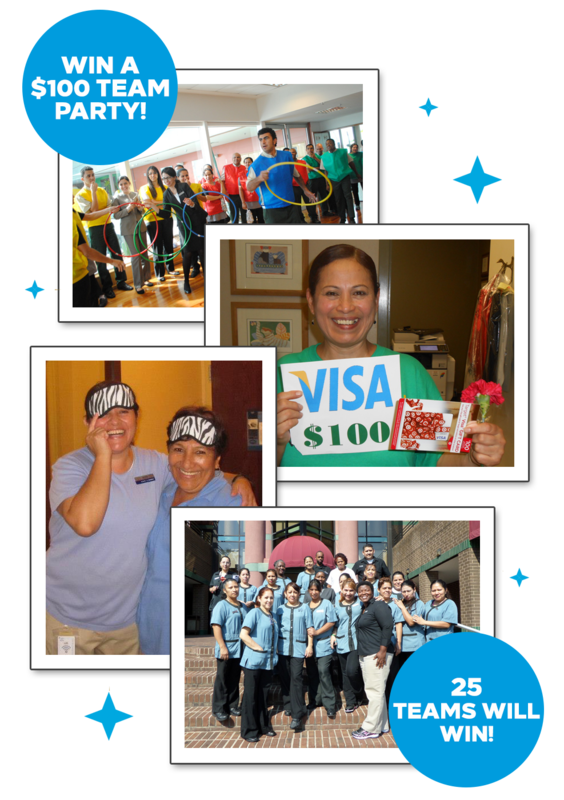 For as little as $1 – $2 per card, it’s a fun, affordable, and memorable way to recognize your Housekeeping team! 27. The Cart of Honor. Create a brand-new cart for a Housekeeping star. Hilton Houston NASA Clear Lake has a cart stocked with brand-new equipment. Whoever has the highest inspection scores gets the cart for the week. Decorate the cart with crepe paper, ribbons, balloons, paint, and poster board. Let the team help with the decorating. You can use this throughout the year! Mail a note of thanks home for their families to see! Embassy Suites by Hilton Dallas – Love Field mails a hand-written thank you card from the GM to each Team Member’s home, so each Housekeeper’s family will know how much they are appreciated. Each department selects one Housekeeper to spoil! Divide your Housekeepers into groups. Ask each department to adopt a different group, and prepare a treat basket for each Team Member in that group. Personalize the baskets, and include thank you notes from everyone in the departments. Distribute them during Housekeeping Week. Variation: Let the Housekeepers judge the best-decorated basket. 30. Lunch With the GM. Get to know your Housekeeping team at lunch! This week, divide the Housekeeping team into small groups. Each day, take a group to lunch with the GM, or bring lunch in. Be sure to include the Executive Housekeeper! The meal can be as simple as an order from a local sub shop or burger joint. The important thing is to take time to get to know your team, and say “Thanks” to them. 31. Create a Brag Board! Let the whole hotel get to know your team. During International Housekeeping Week, dedicate space on a team area wall to celebrate your Housekeeping team. Each day select a group of Housekeepers, and post their pictures and names. Include notable (and appropriate) information about each Team Member. For example, “Sue grew up in Hawaii,” or “Helen speaks three languages,” or “John has three children in college,” and so on. Include a note of appreciation for each Team Member. Change the notes each day, or add additional notes. Get a sponsor for each day’s activities. Get different departments to sponsor Housekeeping Week. That’s one department per day. Ask each department to pick a day and plan a brief activity for that day. This can include a game or contest, a meal, or both! Be creative and have fun. Have each team write a note of praise to the Housekeeping team for their efforts. Nothing says “thank you” like food. Take time to bake goodies for the Housekeeping team. At Hilton Garden Inn San Jose/Milpita different managers personally bake cakes and other treats for their Housekeeping Team Members! This can be done at home or at work, if you have a kitchen. Present the goodies at lunch, or during a break. Variation: Have managers pick up the treats from a bakery. At the Hilton Newark Airport the Executive Committee and Food & Beverage team presented the Housekeeping team with a “Fiesta” celebration. It featured an outstanding array of local and international foods and beverages, and was topped off by a soda fountain ice cream sundae bar. 35. Relax with a Massage. Homewood Suites by Hilton Fargo had a masseuse come to the hotel to give chair massages to the Housekeeping team and other Team Members. Everybody loved it. DoubleTree Suites by Hilton Hotel Atlanta – Galleria presents each Housekeeping Team Member with a red tote bag filled with a water jug, note pad, keychain, candle, manicuring kit, coffee mug, and other small gifts. For their grand finale, the Housekeeping team at Hilton Garden Inn New Delhi/Saket joined the managers for high tea and were presented with a special trophy, individual recognition certificates, and a poster signed by all of their Team Members. 38. Served by the GM. In addition to fun daily activities throughout the week at Hilton Garden Inn Austin Downtown/Convention Center the Housekeeping team is always treated to a special lunch where the General Manager dons an apron and hat and personally mans the carving station. 39. Cultural Lunches and Gifts. Hilton Newark Penn Station had special themed lunches each day for its Housekeeping team with food representing different parts of the world, such as South America, the Caribbean, Asia, and Europe. They also distributed gift cards, T-shirts, water bottles, and gift baskets to Team Members during each lunch. 40. A Great Way to Start the Day. Embassy Suites by Hilton St. Louis – St. Charles recognizes its Housekeeping team with a pizza buffet, an ice cream party, and a delicious cooked-to-order breakfast in the dining area. A good, hot breakfast gets everyone off to a great start for the day! Put all of your Housekeepers’ names in a hat and have each manager (or Team Members from other departments) draw a name. These people will act as “secret admirers” and leave a small gift and anonymous note of appreciation for their chosen Housekeepers each day. On the last day of the week, reveal the identities by personally handing each Housekeeper their gift. 42. The Ice Cream Truck! Treat your hotel to some frozen goodies! During the week, contact a local ice cream caterer and ask them to bring ice cream by at a time convenient to your team (i.e., lunch hour or at the end of the shift). Let everyone choose a free ice cream treat. To find a truck, go to www.partypop.com and type “ice cream truck” in the keyword search. Variation: If you can’t bring in a truck, bring in your own ice cream treats. Recognize the unexpected! Use the online Customizable Certificates to recognize some expected categories, like Longest Service and Best Attendance. But also recognize some unexpected things like Most Contagious Laugh, Brightest Smile, Best Phone Voice, and other surprises. All content is customizable, including language. Make a Spirit Award nomination during Housekeeping Week! Use Housekeeping Week as an occasion to nominate one or more star Housekeepers for the Spirit Award. It’s easy and free, and makes a lasting impact on your nominee! All nominees receive recognition—and those who win will get brand-wide recognition, $350, and more! Go to www.Hilton-Recognition.com/Nominations for more information. Stock a Housekeeping cart full of treats. Include candy, chips, beverages, flowers, and small gifts. Have the managers push the cart all over the hotel, offering treats and gifts to Team Members! Use this time to personally thank Team Members for their efforts. Then leave the cart in a break room for everyone to enjoy throughout the day. Personalize your appreciation with customizable recognition materials! Using the materials located at www.Hilton-Recognition.com/Housekeeping, you can easily create custom candy bar wrappers and water bottle labels. Simply customize your message, output, trim, and wrap around an existing water bottle or candy bar. All content is customizable, including language. Take time to say “Thank You” to your team. DoubleTree Suites by Hilton Hotel Seattle Airport-Southcenter reminds us that “...all of the different offerings are great, but nothing replaces a simple ‘Thank You’ for appreciation.” Take some time this week to offer a few meaningful words of appreciation to each Housekeeping Team Member. 48. Wear Your Housekeeping Pride! DoubleTree by Hilton Hotel Charlottesville had a reception to end the week. Each Housekeeping Team Member received a certificate of appreciation, a bag full of candy, and a T-shirt that read, “Clean Team”! Hilton Anchorage gave each Housekeeper a gift certificate good for one of the following prizes: a one-week pass to the fitness center, one room service meal for their lunch break, a dozen freshly baked cookies boxed to take home, or a 12" round cake for a special event. 50. Get the Word Out. Embassy Suites by Hilton Milpitas – Silicon Valley believes that all hotels should prepare an agenda ahead of time. Two weeks before Housekeeping Week begins, they put big signs all over the break room so other departments can start planning ways to show their appreciation. Increase the excitement with fun competitions! Housekeeping Week is a great opportunity to get to know your Housekeeping team. Use this time to set up fun competitions and events, pitting Team Members against each other; or managers, or other departments, against the Housekeeping team. Homewood Suites by Hilton Madison West held Housekeeping cart races, played shoot the toilet paper through the toilet seat basketball, vacuumed blindfolded, and had bed-making contests! Treat your team like stars with movies and popcorn! Hampton Inn & Suites by Hilton Madison – West picks one day during the week and brings in ALL Housekeepers, so each person has only ten rooms to clean. After finishing early, they gather in a conference room for a movie, popcorn, pizza—and a whole lot of recognition. Variation: Bring slippers for the Housekeepers to wear. Build teamwork while having fun! Form teams of two or three people. Pick one Team Member (or supervisor) in each group to be the Mummy. With that person standing still, wrap him or her with toilet paper. Add your own personal touches, like a hat or sunglasses. Have a prize for the best (and worst) Mummy. You can appoint a judge or have spectators vote. Spice up the week with this cooking competition! Host a contest to see who can make the best homemade salsa. The winner takes bragging rights, and perhaps a prize like a gift card for a local restaurant or retailer. The real fun comes in when the managers who judge the contest MUST sample all entries—including the good, the bad, and the waaaaaaaay too hot! Variation: Select a different food to judge. A game of speed, balance, and coordination. See which Housekeeper can construct the tallest Tower of Soap in two minutes! Have Team Members compete at the same time, stacking bars of soap on top of each other. Watch them topple. When time’s called, everyone stops building. The tallest tower left standing wins! Building teamwork with our eyes closed! Form teams and see which team can fold a standard bed sheet and stuff two pillows into their cases the quickest—while blindfolded! Give each team one or two minutes to complete the task. Whoever has the best time, or can fold the most sheets, wins! A thrilling outdoor event that can generate excitement! Divide into teams, or challenge nearby hotels to a Bed Race. Block off part of the parking lot, and define the start and finish lines. Put beds on large rolling carts, and a manager in each bed. Have Housekeepers push the bed and race for prizes. Bring in lunch for the teams. Idea courtesy of Embassy Suites by Hilton Winston – Sale. Variation: Use Housekeeping carts instead, and set up a simple obstacle course. Can you identify your teammates by their baby pictures? Ask Housekeepers to bring in baby pictures of themselves. Post the photos and invite the department, or the entire hotel, to guess which photo belongs to which Housekeeper. To throw people off, include a baby picture of your GM or other supervisors! Have a prize for the person with the most correct answers. A refreshing way to say “thanks” to your Housekeeping team. DoubleTree Suites by Hilton Hotel Phoenix surprised their entire Housekeeping team with a quick trip to a local convenience store for Slushies and candy bars. It’s a simple and low-cost way to show your appreciation, and get to know your team. Variation: Go to your hotel gift shop for goodies. Who can decorate the wildest cart? DoubleTree by Hilton San Jose held a cart-decorating contest, letting each Housekeeper decorate their cart at the beginning of the week. Housekeepers use balloons, crepe paper, and other non-permanent art supplies. Let the Housekeeping team, or the entire hotel, judge the carts at the end of the week. Have a prize on hand for the Best or Funniest carts! Variation: Decorate vacuums instead. Housekeepers team up with other departments for fun! Form teams of two—one Housekeeper and one Team Member from a different department. Then have the Pro/Am teams compete to see who can perform tasks the fastest: folding sheets properly, correctly stripping and making a bed, etc. Or have the team work together to clean an entire room. 62. Daily “Best of” Contests. Focus on a different area each day. Hampton Inn & Suites Nashville/Franklin (Cool Springs) holds a “Best of” contest each day in different areas, including Tidiest Uniform, Neatest Housekeeping Cart, Friendliest Smile, and Cleanest Corridor. It’s a fun and effective way to focus on specific areas and make improvements fast! Score big with this fun way to build team spirit. After a celebratory luncheon, “strike” up some recognition and play “Bowling for Prizes,” with empty water bottles used for pins and rolls of toilet paper for the balls. The Housekeeper with the highest score wins! Call in a caricature artist for the day to create fun portraits of each Housekeeper. Put the portraits on display during the week, then give them to the Housekeepers. To find an artist in your area, go to www.partypop.com and type “caricatures” in the keyword search. 65. Housekeeper of the Day. Spotlight a different Housekeeper each day of the week. DoubleTree by Hilton Hotel Atlanta/Roswell recognizes Team Members who have exceptionally high cleanliness scores by naming a day in their honor. Use the branded “Featured Team Member” poster to spotlight a different Housekeeper, or group of Housekeepers, each day. Post in a team area for all Team Members to see. 66. Have the Manager Pitch In. At Hilton St. Petersburg Bayfront each room attendant draws a manager’s business card from a bowl, and that manager cleans one or more rooms for them while they watch, or relax. Variation: Have that manager work as the Housekeeper’s assistant for one hour. 67. Say It With Food! Whether it’s simply morning bagels, a nice full lunch, or an afternoon snack, food is a great way to recognize your team and boost morale. Ask various departments or vendors to chip in to host different meals during the week. Variation: Get your managers to bring in or bake treats for the team. Homewood Suites Dallas / Addison holds a Cupcake-Eating Contest, with a prize to the volunteer who can eat cupcakes the fastest. One stipulation: They can’t use their hands! The GM says it’s about the most fun their team has ever had. For added fun, include managers. A game of skill, coordination, and silliness! Get an assortment of 10 objects of various sizes and shapes—paper wads, empty paper coffee cups, empty water bottles, shampoo bottles, and so on. Then see who can throw the most objects into a wastebasket from a distance of 10 or 15 feet. Hilton Garden Inn Gettysburg had a different theme for each day of Housekeeping Week. One day was “Dress Up Your Carts,” and all of the Housekeepers had a blast decorating their carts however they pleased. 71. Volleyball and Night Fishing. Conrad Maldives Rangali Island wrapped up its week of festivities with the distribution of prizes and certificates, followed by a volleyball match and night fishing with the Management Team. At Embassy Suites by Hilton Austin – Central, the Revenue Manager provided donuts and coffee for breakfast. For lunch, the Housekeeping Managers brought in enchiladas. And dessert included cupcakes and a pillow-stuffing race! At Homewood Suites by Hilton Sacramento Airport–Natomas the managers put on ponchos and goggles, while the Sales Department prepped pie pans full of whipped cream and chocolate syrup. The end result was a load of laughs and cheers as each Housekeeper got a free shot at hitting the GM, AGM, or Executive Housekeeper in the face with a pie! Homewood Suites by Hilton Gainesville had a contest for its Housekeeping team that challenged them to make a “Gator” out of play dough and other props. At the end of the week, everyone voted on the best Gator and creativeness, and the winner got to proudly display their creation. Hilton Orlando had a Wii game break! Each floor was assigned a 30-minute window to come down and play Wii. In addition, “Sweet Treat Bags” were distributed to each Team Member at the end of their shift. Hilton Antwerp Oldtown held an Olympic-style competition involving their Housekeeping team and celebrated the international diversity of their team by having Team Members dress in clothing specific to their home country. At Hampton Inn by Hilton Lexington – Historic District 50 photos of Shrek—their Housekeeping mascot—were taped all over the laundry and break rooms. At break time, the team had to see how many they could find. The winner won a gift bag that included all three Shrek DVDs, along with microwave popcorn and Snowcaps®. At Hampton Inn by Hilton Harrisburg–East (Hershey Area) the Housekeeping team participated in the “Dumpster Dash,” where Housekeepers ran to the dumpster, deposited a bag, and returned. This really got their blood pumping, and Team Members from other departments cheered for them as they raced. Embassy Suites by Hilton Cincinnati – Northeast (Blue Ash) concluded the week with “The Taste of Embassy,” a potluck lunch where each Housekeeper brought in a dish that they enjoyed cooking and eating. The lunch was a huge hit and represented six different countries. DoubleTree by Hilton Hotel Richmond Downtown had a Housekeeping Week talent show called “DoubleTree’s Got Talent.” The show started off with the managers dancing the Macarena—led by their General Manager, who was dressed in a giant cookie suit. Completely unravel a roll of toilet paper. Catch jellybeans in their mouths. Legibly write the entire alphabet on an old bed sheet—with a bottle of chocolate syrup! September 13th is International Chocolate Day. Try celebrating with a chocolate fondue party for your Housekeeping team. You could dip things like marshmallows, strawberries, pretzels, pound cake, chocolate chip cookies, and donut holes—just to name a few! DoubleTree Suites by Hilton Hotel Naples embarked on a fun afternoon of kayaking with its Housekeeping team. It was a fantastic time of bonding for the team. It was also hilarious to watch some of the first-time kayakers zigzag down the river! Embassy Suites by Hilton Orlando – Downtown divided their Housekeeping team into teams and gave them a tray containing 1 box of Fruit Loops®, 12 straws, scissors, tape, glue, and 3 pieces of construction paper. The challenge? They had 30 minutes to build something—anything—but use all the materials and have fun. At DoubleTree by Hilton Hotel San Francisco Airport, one of the Lobby Attendants brought his guitar and everyone had a sing-along. Housekeeping Team Members were also given gifts and raffle prizes. 86. Let’s Make a Deal. DoubleTree by Hilton Washington, DC played “Let’s Make a Deal.” Housekeepers were asked to bring in various items that could then be traded for prizes. Hilton Brentwood/Nashville Suites had a “Finding Nemo” contest where Nemo dolls were hidden in the public areas of the hotel. The Housekeeping team searched for them, and each Nemo that was returned was good for a gift certificate. The managers had just as much fun hiding them as the Housekeeping team did finding them! After a week of fun, games, and food at Hilton Amsterdam, the final evening included karaoke and dancing. Everyone had a blast. During Housekeeping Week, DoubleTree by Hilton Hotel Dallas Near the Galleri hosts a “Supermarket Sweep.” The top performing Room Attendants from the past 12 months (based on cleanliness scores) are awarded a 60-second shopping spree. The whole Housekeeping team goes out to the neighborhood grocery store, and everyone cheers on the winning participants. The winners usually take home about $200 worth of groceries! Then the management team takes everyone out to lunch at a nearby restaurant. DoubleTree by Hilton Hotel Philadelphia Center City had a tarot card reader come to the hotel. They were amazed at how many Housekeeping Team Members wanted their fortunes told—and at how funny some of those fortunes were. Arm your Housekeepers with cleaning bottles filled with water. Have them line up and try to hit various targets. For each target hit, the Housekeepers are rewarded with a small prize. Hint: Cover each target with a piece of colored construction paper, so it will be easier to see where the water hit. Divide the Housekeeping team into teams, and give each team one yellow cleaning glove. One at a time, a Housekeeper fills up the glove with water and walks it across the room to fill up a mop bucket. The first team to fill their bucket wins. Fun variation: Poke a hole in one finger on each team’s glove so that a constant tiny stream of water is leaking out of the glove during the race. 93. Housekeeper of the Day. Visit The Rec Room and recognize your Housekeeping team. Share a memorable story—or simply tell us why you appreciate them. Your post will be published to share with hotels around the globe. Put a spin on the classic potato sack race by using pillowcases instead of potato sacks. Team Members must climb into the pillowcase, hop across the room and around a bucket or cone, and then back to the starting point, where they must pass the pillowcase off to the next Team Member. Variation: Try playing outside—grass is a great way to cushion a fall. Have a Housekeeper spin around three times. Then, have another Team Member pitch a roll of toilet paper, and have the Housekeeper hit it as hard as they can with a wiffle bat. Team Members who make contact with the toilet paper, and hit it the furthest, receive a small prize. Ask each Housekeeper to draw what animal represents their best qualities. Maybe an octopus represents a magnificent multi-tasker, or a cheetah fits someone who cleans rooms the fastest. Pin these to a team bulletin board, or cut them out and wear them as badges! Organize some relaxation for your Housekeepers by bringing in a yoga or meditation instructor for a 30-minute session. It’s a great way to de-stress and re-fuel! Have Housekeepers design their own medals! Print the 2019 Housekeeping logo on yellow, gray, and orange card stock and have Team Members cut them out and lace ribbons through the tops. Customize each medal with a personal message! Carefully trace each Housekeeper’s right hand on a piece of paper and hang these on a wall in the Team Member area. Have Team Members guess which hand belongs to which Housekeeper. Whoever has the most correct guesses gets a small prize—and everyone has to give them high fives for the rest of the day! Challenge Housekeepers to a Wet Soap contest. Divide Housekeepers into pairs and give them a wet bar of soap. See how long they can toss it back and forth without dropping it! Set up 20 coffee services, each with something missing, wrong, duplicated, etc. The Housekeeper who can correct all mistakes to brand standard in the shortest time wins a coffee break! Because we just couldn't stop at 101 ideas! At Hilton Santa Cruz/Scotts Valley, the Engineering team added a sweet surprise to International Housekeeping Week by stringing up a piñata full of goodies. Your Housekeepers are full of unusual cleaning tips and secrets. Ask for their best advice, then compile into books to pass out to Team Members (be sure to give credit to your Housekeepers!). You might be surprised by what you learn. Hang a white board or a big, blank piece of butcher paper in your team area. Ask all Team Members to write a kind word to your Housekeepers. Take a picture, or save the paper so everyone can remember the nice things that were said. Invite Housekeepers on a fun trip around the hotel. One rule: You can’t walk! You can skip, hop, jump, or dance, but no walking! Get other Team Members to join your parade. Now You’re Speaking My Language. Do your Housekeepers speak several languages? Recognize diversity on your team by taking a tip from 2013 International Housekeeping Week winner Homewood Suites by Hilton Shreveport/Bossier City, who conducted their morning huddles completely in Spanish. Play this fun game from Hilton Garden Inn Minneapolis / Maple Grove: Spread mini marshmallows on a flat surface. Challenge Housekeepers to use a straw to pick up marshmallows and put them in bowls. See who can get the most in 60 seconds. If you’re hosting a breakfast or lunch for your team, make it extra special by creating Housekeeping placemats. Using Word, Paint, or another program, fill a sheet with pictures and facts about your Housekeepers. Print and laminate. Split Housekeepers into teams of two or three. Give them all different boxes of wacky ingredients, like a banana, cheese, and mayonnaise. See which team can create the tastiest snack in 10 minutes. Ingredient swapping is allowed! Invite an instructor from a local fitness club to invigorate your team with a 30-minute dance or Zumba lesson. Extend an invitation to a local craftsperson, such as a baker, a painter, a glassmaker, or another craft, to give a demonstration to your Housekeepers. Be sure to share pictures of what your team creates! We loved this idea from Hilton Garden Inn Colorado Springs: Give Team Members a variety of fun materials, such as crepe paper, stickers, and sparkles, and let them embellish their uniforms. *All brands will be eligible for separate prizes, with the exception of the following: Homewood Suites by Hilton and Home2 Suites by Hilton will be combined. Conrad and Waldorf Astoria will be combined. Submit a photo of your Team Members, along with a shoutout telling us how you’re celebrating, for a chance to win one of 25 team parties valued at USD $100 each. To be eligible, all you have to do is submit a post to the global Wall of Fame or your hotel-specific scrapbook. You can also share your photos on social media using the tag #IHW18. Winners will be announced in the October “Recognition Matters!” newsletter. Get the Word Out. Embassy Suites Milpitas – Silicon Valley, CA, believes that all hotels should prepare an agenda ahead of time. Two weeks before Housekeeping Week begins, they put big signs all over the break room so other departments can start planning ways to show their appreciation.